Cobblers boss Justin Edinburgh has appointed Jim Hollman as the club’s new goalkeeping coach. The 38-year-old is switching life in the Scottish Premiership with Motherwell to take up the role at Sixfields, replacing Paddy Kenny. “I am delighted to bring in Jim who is a hugely respected goalkeeping coach,” said Edinburgh. 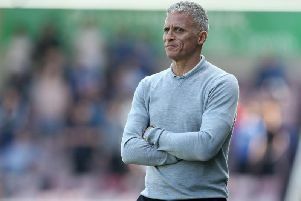 “He has worked with and helped develop some established international and Premier League goalkeepers, and he enjoyed some notable success when working with Norwich City, Ipswich Town and Cardiff City, where he worked with (Cobblers assistant boss) David Kerslake, who speaks very highly of him. Motherwell manager Mark McGhee said: “We have all really enjoyed working with Jim and thank him for his tremendous work with the club over the past 18 months. Hollman started his coaching career with Ipswich Town in 1998 before becoming the senior goalkeeping coach at Norwich City in January 2000, aged just 21. He spent more than seven years at Carrow Road, working with future England keeper Robert Green. Hollman, who was born in Felixstowe, returned to Portman Road and was part of the coaching team that helped the Tractor Boys reach the 2011 League Cup semi-finals, but he was recruited by Cardiff City as their senior goalkeeping coach in July 2011. While in south Wales he won his second promotion to the Premier League as City won the championship in 2013/14. Hollman then joined Scottish outfit Motherwell in the summer of 2015. Among the goalkeepers to have benefitted from Hollman’s coaching are Scotland international David Marshall, England internationals Tom Heaton, Green and Richard Wright, as well as Asmir Begović, Matt Gilks and Darren Ward.